Washington, DC-based artist Linn Meyers creates densely configured compositions that shimmer like the play of light moving across the surface of water. These intricate works of art are created through a process by which the artist lays down consecutive strokes of acrylic ink, creating rhythmic and repetitive patterns. Meyers makes drawings and paintings in a range of scales from page-sized images to large works on Mylar, and in recent years the she has also been creating room-sized, site-specific works. Ambitious in scale and effort, these wall drawings can take several weeks to complete. The installations are a response to the architecture of each specific space and the surrounding elements. Linn Meyers (born 1968) received her BFA from The Cooper Union, New York, NY (1990), and her MFA from California College of the Arts, San Francisco, CA (1993). Since 1990 she has received numerous awards and fellowships, most recently the DC Commission on the Arts and Humanities Artist Fellowship Award (2012 and 2013) and the Smithsonian Artist Research Fellowship, Smithsonian Linn Meyers: Blue Study March 1 – May 4, 2014 Lederer Gallery Institution (2009), both in Washington, DC. Her many group shows and solo exhibitions include Every Now. And Again, at The Hammer Museum, Los Angeles, CA (2011), and At the Time Being, The Phillips Collection, Washington, DC (2011). 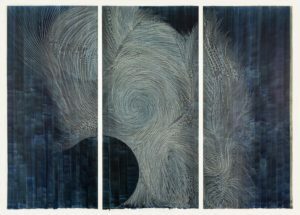 Linn Meyers’ work can be found in public and private collections throughout the country, including The Hirshhorn Museum and Sculpture Garden; The Smithsonian American Art Museum; The National Museum of Women in the Arts; and The Phillips Collection. Meyers is represented by Sandra Gering, Inc in New York. The works in this exhibition include preparatory studies, works on loan from private collections, and new works on Mylar. The large triptych, Blue Study, was created by Meyers for her exhibition at the Academy Art Museum. The video pieces on view in the Atrium were produced by The Hammer Museum, Los Angeles, CA, and The Phillips Collection, Washington, DC, as documentation of the artist’s site-specific projects at those institutions.